Before I start, I promise we'll have something up Thursday about the lessons we can learn from the flooding in the south. That's one of those stories we can't ignore, but I just couldn't get it right in time for today. I was looking at the categories over to the left there, and I noticed we've been doing a lot of "what to do" and not very much "how it all works" or "why worry." To be fair, this may be a problem of how we categorize more than what we cook, but I don't want to ignore the possibility that something else may be afoot: it's always easier to tell people what to do than it is to explain the problem! This post is an effort to make sure we are offering a balanced diet at the Green Light Dhaba. Since explaining the world simply is so difficult, I thought I'd bring in a guest lecturer. That's not easy to do, but after screening a twitterload of applicants, I found Annie Leonard, an American who is responsible for creating a short film called, The Story of Stuff. We make a lot of fun of the Americans down here at the Green Light Dhaba, and I think it's safe to say they deserve it most of the time. But once in a while they do something really great. Like this or this or this. The Story of Stuff may not rank up there with the abolition of slavery, women's suffrage, or Jazz Music, but it's still a pretty good thing. Annie Leonard spent a lot of time thinking about where stuff comes from, how it gets made, and where it goes after we are finished with it. And she made an video explaining her thoughts, which you can watch for free on-line. It will answer questions you may have never asked--like how can some things be so cheap when their component parts came from all over the globe? Who pays for the mining and the shipping--much less the cost of putting it all together and selling it? The best part is, you will actually enjoy this! I kid you not. Leonard opens with a deceptively simple idea: "You cannot run a linear system on a finite planet indefinitely." In other words, if you only have one planet, you can't keep taking stuff out of the ground, making it into other stuff and then throwing it away, because sooner or later you will run out of something. In fact, Leonard argues, you will run out of a lot of things, and you will poison a lot of people along the way. Leonard explains this and a lot of other interesting things-- like why recycling is good, but it will never be enough! (Hint: a huge amount of waste is created in the process of making the stuff you feel so good about recycling.) She paints a big picture in broad strokes, and most of what she says makes sense. The Story of Stuff won't be enough for those of you doing post graduate work in environmental science; but for most of us, it's a good place to start. 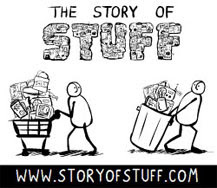 The Story of Stuff is animated, but it's not just for kids. However, if you do have children, you should watch it with them. I f they are younger than 12, they won't understand a lot of it. But here's the great part: because the animation is so engaging, they will not complain. In fact they might even ask to watch it again...mine did! The Story of Stuff is kind of America-centric (it opens with an I-Pod of all things), but it's made in America, so I guess that's fair--besides, the Americans have a lot to learn about...stuff. My only real complaint is that among the many languages into which this has been translated, you will not find one (other than English) that is widely spoken in India. Here's the full version. If your internet connection makes video streaming difficult, like mine sometimes does, go to this page and download the file. It's all free! By the way, I've put up some new links to the side there, both to blogs and organizations; check them out when you have some time on your hands. And remember, if you like what you see at the Green Light Dhaba, please spread the word, blogroll us, you know the routine! Watching now :) I agree with the linear system concept of course. Had written a blog post on it once: http://www.bhagwad.com/blog/2009/politics/democracy-in-india-ignoring-the-naysayers.html . The real challenge however, is getting this stuff to the mass market. I've noticed a lot of Americans feel threatened when we talk about overconsumption - as if the basis of their lifestyle is being threatened. It's not, and that's the key. For Americans to realize that they're not defined by what they consume - that they don't have to have the biggest and best, because not everyone can sustainably have the same. Maybe the American lifestyle is being threatened--maybe it's unsustainable. But that doesn't mean another American lifestyle cannot develop--like you say, one that need not depend on biggest and best. It will take time to get to everyone. But things like the story of stuff help educate people and that's a start. I guess the Story of Stuff is causing some controversy in the US; that's probably a good sign--means someone is paying attention. My mistake! I gave the wrong link :) : http://www.bhagwad.com/blog/2009/environment/the-real-cost-natural-resources.html - sorry! Thanks for the great review! We know that it isn't in any commonly spoken language in India, and we are looking into that as well as more more videos that help expand the Stuff-iverse. Stay tuned! Wow! A comment from the good folks at Free Range Studios. Thanks for stopping by! Shared The Story of Stuff with my kids. Excellent. Then I saw this little clip on saliloquy and shared that as well.